I don't really have a lot of time on my hands to really get into a book. I'm forever seeing things I would like to read but never get round to picking them up. I was given a book for Christmas so made sure I give it a go. 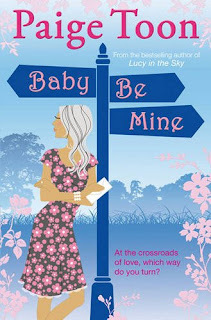 The book was 'Baby Be Mine' by Paige Toon. I've read all of her books and they are amazing. I'm dyslexic and sometimes find it really difficult to get into a book, sometimes the font is the wrong style or there are too many words squeezed onto a page or I'm just simply struggling to read it. I have a habit of picking up a book reading a few chapters then never going back to it. But for some reason all of Paige Toon's books have been completely different, and this was no exception. It is a follow on from one of her previous books 'Jonny be good' but you don't need to have read that one to understand this new one. It was a complete page turner just like her previous ones. Basically Meg (the main character) has a Son with her partner who she knows isn't his Father. His father is actually a famous rock star. The whole book is following Meg's life as she decides what is best for her, her son and the two baby-daddy's. If you like a good chick-lit this is perfect, trust me you wont be disappointed. You can get hold of any of Paige Toon's books from amazon. Any chick-lit recommendations for me? Thx for following my blog dear, I'm doing the same!